How Does Target CPA Bidding Work? This guide is a detailed look at Target CPA bidding, if you are unfamiliar with this bidding technique or bidding strategies in general; you may want to read our introduction to bidding strategies first. Target CPA (Cost per Acquisition) is an automated bid strategy that allows you to specify a target CPA to which AdWords will aim to hit across all of the campaigns to which the strategy is applied. There are two flavours for automated bidding strategies, which we describe below in more detail. You need to be currently tracking conversions, which requires you to have implemented tracking code on your site or have imported them from Google Analytics (which still requires you to have installed tracking code). The campaign or ad group must have received 15 conversions within the last 30 days. Although this is the minimum amount required, typically the more conversion data available provides AdWords with more data with which to make decisions. This makes the tool more effective and better at predicting user behaviour. The campaign or ad group must have received conversions at a consistent rate over the last few days… Again, the more data and the more consistent the data is the better Google will be at hitting the CPA target. We cover the specifics of how this works later in this guide. Portfolio bid strategies can be applied to multiple campaigns and they work across all of these campaigns to achieve targets. In the case of ‘Target CPA’, this will apply a target spend across all of the campaigns to which it is applied… meaning that some campaigns may under Target and some may be over target, but in total the target should be met (when aggregating across all of the campaigns). CPA is calculated by dividing the cost by the conversions for any entity that you would like to see the CPA for. CPA bidding automates your bids such that the bids (total cost and number of conversions) equate to your specified Cost Per Acquisition. AdWords sets bids when an auction is triggered and thus bids are changes and optimised for the target CPA based on how likely the ad is to convert. This effect can be achieved through manual bidding by adjusting bids based on historical data, but this requires more work and some understanding of the mathematics involved. Automating this can reduce workload but should never be seen as a silver bullet. Simply entering a CPA target does not mean that the target will be achieved or is even achievable! Name: This is arbitrary and is simply a label for the bid strategy. Campaigns: You can choose what campaigns you would like to apply the bid strategy to, from the list of all eligible campaigns provided. Target CPA: This is where you define the Target CPA value. As mentioned there are two flavours of target CPA bidding available, we describe how each of these works below. Both methods use historical data to make predictions on how likely users are to convert and adjust bids to find an optimal CPC for your ads whenever they are eligible to appear. Bear in mind that there are a lot of factors that are not within Google’s control such as website changes, changes in prices, products, competition, seasonality, etc. Both methods ignore bid adjustments set at any level (ad scheduling, mobile, etc), using real-time data in place of this. Max CPA: Using this method, Google will aim to not exceed the CPA target, this means that (if it works) you will be more likely to come I under target. 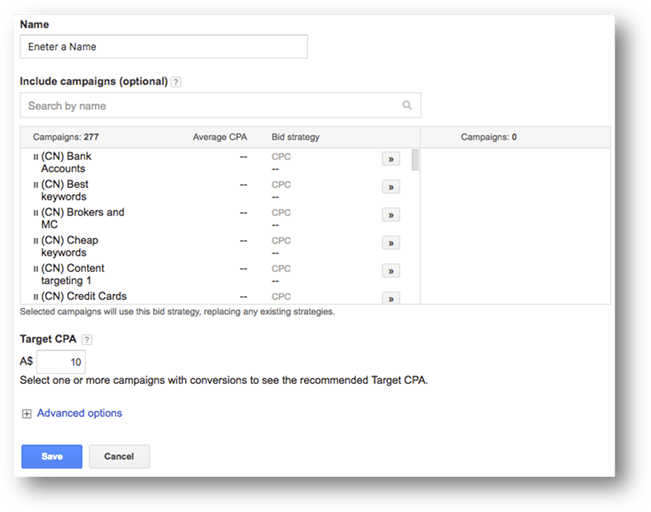 Target CPA: Using this allows Google to exceed target CPA with the aim of, on average, being on-target. There are two main settings, in addition to the CPA target value, that you can set in order to fine tune / control bidding. This is the maximum you would be prepared to pay for a click, you can use this to set limits on bids. A factor that should be evaluated with all CPA bidding is what the tool should consider / count when working to a CPA target. All of the options below change the volume of conversions that are counted and thus included within the CPA… Because the CPA is calculated by dividing the Cost by the No. of conversions, the way in which conversions are counted will affect the actual CPA. We discuss the options available for this below. Converted Clicks count the number of Clicks that resulted in a conversion. 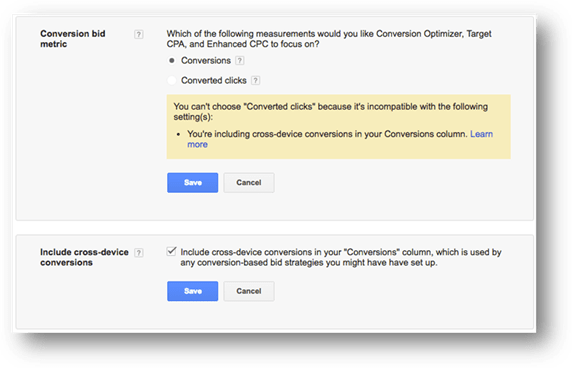 Some clicks may have resulted in more than one conversion, but this method will count this as one converted click. The ‘Conversions’ metric counts the total number of conversions rather than the number of clicks that resulted in a conversion. Consequently, the conversions metric will typically be greater than the number of converted clicks. For example, if you had a campaign with 100 clicks, 75 of those clicks resulted in a conversion, and you saw 200 total conversions… You would have 75 Converted clicks and 200 conversions. This means that on average a converting click will result in 2.67 conversions. Depending on the type of conversions you measure, you may want to count converted clicks or conversions. Including cross device conversions will also change the volume of conversions that are counted and thus this will affect the CPA.